The Nathan's Famous Fourth of July Hot Dog Eating Contest is an annual contest sponsored by Nathan's Famous held on Coney Island, N.Y. Competitors have 10 minutes to eat as many hot dogs as possible. The competition was held for the first time in 1916 and has been held annually (with two exceptions) since then. The event draws as many as 40,000 spectators to the Nathan's Famous restaurant and has been broadcast on ESPN since 2004. In 2011, there was a separate women's competition for the first time. Joey Chestnut is the defending and five-time champion, having won his fifth consecutive title in 2011. He holds the world record for eating 68 hot dogs in 10 minutes, which he managed in 2009. The Nathan's Hot Dog Eating Contest is decided between 20 contestants who compete to see who can eat the most hot dogs and buns in 10 minutes. Contestants must be members of the International Federation of Competitive Eating and must be 18 or older. Each year, the defending champion is invited to compete, and the other contestants are chosen with regional qualifying competitions. Two wild-card contestants are invited, based on the highest qualifying score without winning. The IFOCE also can issue special invitations for contestants. The qualifying contests have been held since 1993, becoming international in 1997. At the event, the contestants stand on a platform behind a table. They are given plates of hot dogs, as well as the drinks of their choices (most use water). Condiments are allowed but rarely used, and hot dogs are cooled slightly so they don't burn contestants' mouths. Contestants have 10 minutes to eat as many hot dogs and buns as possible. Until 2008, the contest had been 12 minutes long for decades, but Nathan's learned that the original contest likely was 10 minutes. When time is called, contestants may swallow any hot dogs still in their mouths and count that number. A hot dog can be partially eaten and is measured in eighths. Judges will decide if there is an excessive amount of buns or hot dogs left on the plate and can deduct a contestant's score. After the winner is determined, organizers bring out a plate with the number of eaten hot dogs for photos with the winner. The winners received cash for the first time in 2007, $20,650 doled out to the top eight finishers. First place earned $10,000. In 2011, a women's competition was added for the first time, held prior to the main competition. Prior to 2011, women competed against men in the main competition. The first Nathan's Hot Dog Eating Contest was held in 1916, the year Nathan's opened its first restaurant on Surf Avenue in Coney Island. According to Nathan's legends, that contest on the Fourth of July was held between four European immigrants. The men had a hot dog eating contest to determine which of them was the most patriotic -- whoever could eat the most hot dogs was the most American. That first contest was won by James Mullen, an Irishman, who ate 13 hot dogs in 12 minutes. Since then, the contest has been held every year, except two, on the Fourth of July at Coney Island. In 1941, the contest was canceled as a protest to war in Europe, and in 1971, it was canceled as a protest to civil unrest. The format has changed often, with the contest dropping to three-and-a-half minutes in the 1970s and increasing to 10 in the 1980s. In 1978, Walter Paul set new event, U.S. and world records that would stay for the next 13 years. In 1980, the contest had its first "eat-off": After Paul Siederman and Joe Baldini each finished nine hot dogs in 10 minutes, they each had three-and-a-half hot dogs in the eat-off, and they eventually were declared co-winners. Paul's records were finally broken in 1991, when Frank Dellarosa ate 21.5 hot dogs in 12 minutes (the time had just been increased two minutes). He defended his title the next year, eating 19 hot dogs. Nathan's changed its format for the contest in 1993, using qualifying events to select its contestants for the first time. 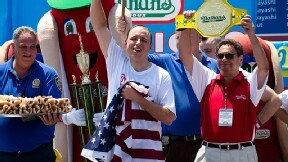 American Mike DeVito won that contest with 17 hot dogs, his second title. Devito won his third in 1994, when Nathan's hosted a special one-on-one contest between De Vito and Japanese Orio Ito. De Vito won the Mustard Yellow International Champion belt and reunited the three international hot dog eating titles. New world records were set in 1995 and 1996. First, Ed Krachie ate 22.25 hot dogs at the Nathan's contest in July 1995. Later that year, Hirofumi Nakajima ate 23.25 dogs in a contest in Central Park in New York. 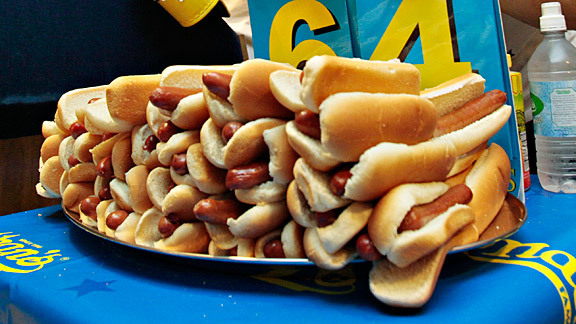 At the 1996 Nathan's contest, Nakajima bested his own record with 24.5 hot dogs. By 2001, the world of competitive eating had grown in popularity and in attendance. Takeru Kobayashi, a young Japanese man, participated in his first Nathan's contest that year and proceeded to break the world record of 24.5 hot dogs -- in less than five minutes. He finished the 12-minute contest with 50 hot dogs, setting a distant new world record and doubling the event record. Kobayashi went on to win the next five Nathan's contests, setting two more world records. He ate 50.5 hot dogs in 2002, bettered that mark to 53.5 in 2004 and increased again in 2006 to 54 hot dogs. In 2007, Kobayashi was beaten for the first time, by a new American competitor, Joey Chestnut. Chestnut had broken the world record at a qualifier in June, and he shredded his own total at Nathan's with 66 hot dogs eaten. Kobayashi came in second, finishing with 63. The next year, the contest was dropped down to 10 minutes once again. Chestnut and Kobayashi tied with 59 hot dogs eaten in 10 minutes, so the event had its first eat-off since 1980. The two men had five more hot dogs to eat, and Chestnut edged Kobayashi by just a bite. Chestnut set a new world record -- in two minutes less time -- in 2009 after eating 68 hot dogs, and he became only the second man (with Kobayashi, who again finished second) to win three in a row. Chestnut made it four consecutive in 2010, with 54 hot dogs eaten. Kobayashi refused to participate in the 2010 contest but did attend the event, eventually causing an incident and being led away by police. The Nathan's contest has had a female winner twice in recent decades: once in 1982, when 18-year-old Melody Andorfer ate 12 minutes, and in 1984, when 17-year-old Birgit Felden ate 9.5 hot dogs in 10. Since then, the strongest female competitor has been Sonya Thomas. Thomas set a new female record in 2003 with 25 hot dogs eaten and has bettered it four times since, her best currently at 41 in 2009. She finished fifth that year (her personal best is second, in 2005). In 2011, Nathan's announced that men and women would compete separately. Since 2004, the contest has been aired live on ESPN. In 2003, the event was shown on a tape-delay. In 2010, the event was watched by 1.677 million, the highest total ever.